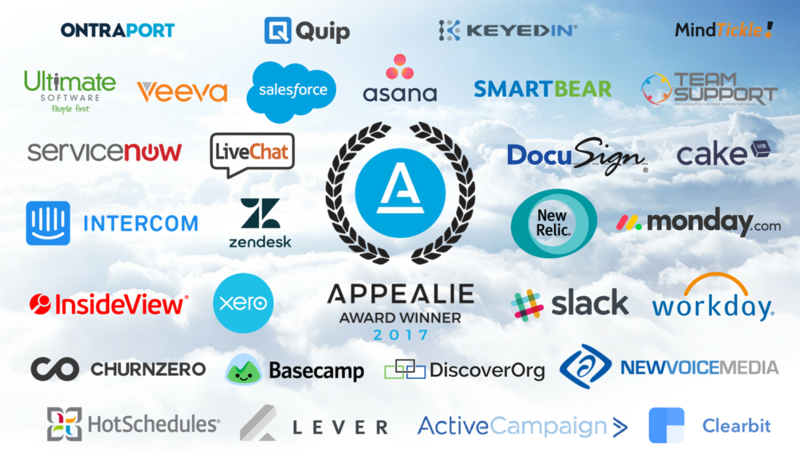 January 10, 2018 – APPEALIE has announced the winners of the 2017 SaaS Awards. 31 SaaS apps were recognized for their demonstrated excellence and customer delight. Winning SaaS platforms included Intercom, LiveChat, Salesforce, ServiceNow, Slack, Xero, and Zendesk. The competition consisted of four categories – Overall SaaS, SaaS Customer Success, iOS Mobile SaaS App, and Android Mobile SaaS App. Entrants supplied data – including Net Promoter Scores™ and customer survey responses – and documentation for their best customer success stories and outcomes. Entries were evaluated by a judging panel of customer success experts from Chargebee, MeetEdgar, ProsperWorks, and Reply. APPEALIE honors apps with real appeal. APPEALIE hosts a SaaS Awards program with winning apps selected on the basis of customer feedback and data. Each competition consists of four categories – Overall SaaS, SaaS Customer Success, iOS Mobile SaaS App, and Android Mobile SaaS App – and is judged by a panel of software experts. Attribution: Net Promoter, Net Promoter Score, and NPS are registered trademarks of Bain & Company, Inc., Satmetrix Systems, Inc., and Fred Reichheld.